Of the International Brotherhood of Electrical Workers. With approximately 1,600 members across New York State, we represent the best, most skilled and hardest working utility and energy workers in the region. We consist of 7 units across the Empire State with members who work at New York State Electric and Gas, USNYPP Cayuga and Somerset Generating Stations, Delaware Electric Co-Op, Otsego Electric Co-Op, Oneida Madison and Steuben Rural Electric Co-Op. We are more than just a union; we are community volunteers that care about our neighbors and the communities we serve. We believe that nothing is more important than working safe, and ensuring that our members make it home to their families at the end of the day. That is one of our highest values. We brave the elements, through snow, ice and thunderstorms, floods and hurricanes, to keep the gas and the electric on. We lend our labor to benefit those who need us most. We believe that improvement and maintenance to the infrastructure of the energy delivery system not only protects good paying jobs, but also protects the environment and provides safe and reliable service to the consumer. We take pride in our work, and we always are willing to lend a hand to a good cause of charity. 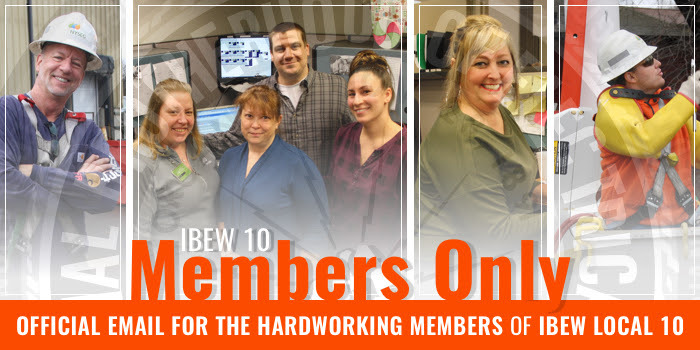 We are Local 10 of the IBEW, New York’s best utility and energy delivery union.